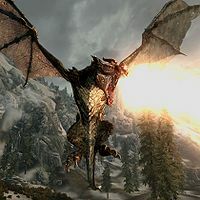 Mirmulnir is likely the second dragon you will encounter in Skyrim, after Alduin. The dragon appears during the quest Dragon Rising at the Western Watchtower. He can be a challenging enemy if your level is low and you have only melee weapons. If you are heavily injured you can go inside the watchtower to heal yourself while resting, or stay there and do nothing while the guards attack him. Using lightning or ice magic on him would be wise since he is resistant only to fire. As with other dragons, after Mirmulnir is killed you can take from his corpse dragon scales and dragon bones, as well as random treasure and several unique pieces of Whiterun guard armor. Mirmulnir's name can be broken down into Mir Mul Nir, literally 'Allegiance Strong Hunt'. The type of dragon that Mirmulnir is depends on your level. The Atlas of Dragons lists Mirmulnir as being "Known to Live", meaning not likely revived by Alduin. Instead, he may have come out of hiding to again serve Alduin. Mirmulnir carries a random number of Whiterun guard outfit parts, which have a special property: if sold to a merchant, they will persist in the merchant's inventory even after it resets; if placed onto the corpse of a named NPC, they will prevent it from disappearing. With subtitles enabled, it is possible to see Mirmulnir say "Dovahkiin! No!!" while he dies. As the dialogue has no audio files in the English version of the game, you would only be aware of this via subtitles. Mirmulnir may also say other things during the fight such as "You are brave. Balaan hokoron. Your defeat brings me honor. ", "Brit grah. I had forgotten what fine sport you mortals can provide!" and "Thurri du hin sille ko Sovngarde!" This page was last modified on 29 October 2016, at 16:09.